One of the smallest and lightest boilers on the market it's just 60cm high - the Ferroli Modena 32c HE boiler is also one of the quietest. This A rated high efficiency combi boiler is Energy Saving Trust approved and benefits from a SEDBUK 2009 efficiency rating of 90.3%. It's one of the most energy efficient boilers available. Reliable and easy to service and maintain from the front of the unit one of the main advantages of the Ferroli Modena 32C HE boiler is hat it has no plate to plate heat exchanger or diverter valve. In fact it only has 4 working parts in the shape of a fan pump gas valve and DHW flow meter. The boiler features a stainless steel bi-thermal heat exchanger and operates on both natural gas and LPG. Aside from an optional external temperature sensor kit the Modena 32C HE can be used with Ferroli's newly launched bigger and better backlit digital clock its mechanical 7-day timer or radio-controlled room thermostat. 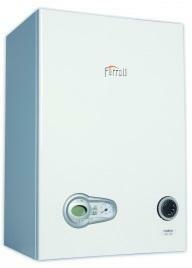 The Ferroli Modena 32C HE is comes with a 3 year warranty as standard. However extended warranties are also available.